Since I had made burgers and sandwiches a few times last week as items for dinner, I also wanted to come up with some new side dish options to go along with them. in my house, french fries are pretty much a must when we have burgers in the house so I either go with store bough fries or I make my own oven fries, which are also great. I do like to try different coleslaw recipes as well to give us something new. There are many variations on coleslaw recipes, and some use mayonnaise while others do not. I have tried each and some with mayo tend to be a bit too much, so lately I have been leaning more towards other options, such as this recipe from Cook’s Illustrated for a coleslaw with bacon and buttermilk dressing. 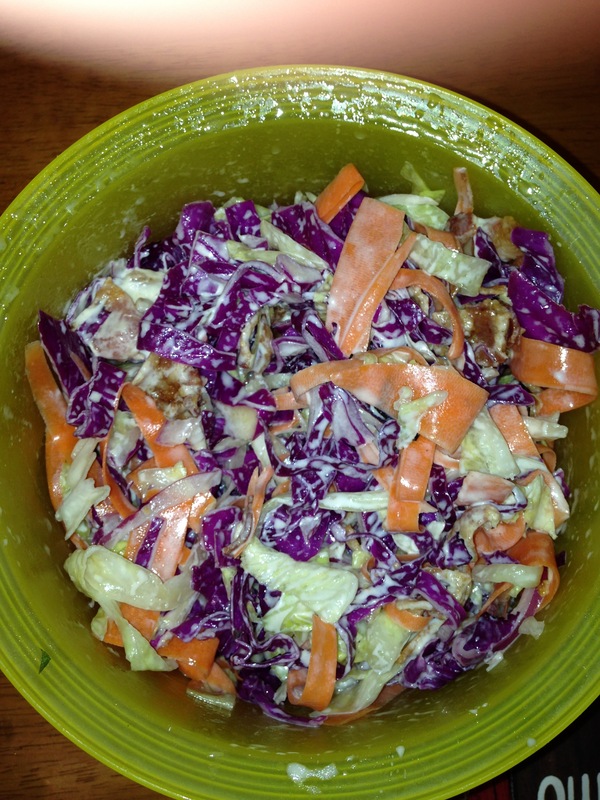 It is really more like a cabbage salad than a coleslaw and this one strives to be a little less watery than some other options by salting the vegetables first. Toss the shredded cabbage, the grated carrot and the sliced onion and 1 teaspoon of salt together in a colander or fine mesh strainer set over a medium bowl. Let the vegetables stand until the cabbage wilts, at least 1 hour or up to 4 hours. Rinse the vegetables under cold running water or in a large bowl of ice water. Press, but do not squeeze, to drain the vegetables. Pat the vegetables dry with paper towels. you can store the vegetables in a zipper-lock plastic bag at this point and refrigerate them overnight if you wish. Fry the bacon pieces in a medium skillet set over medium heat until it is crisp and brown, about 6 minutes. Transfer the bacon with a slotted spoon to a paper towel-lined plate to drain. Discard the fat from the skillet. Stir together the buttermilk, cider vinegar, vegetable oil, caraway seeds, dry mustard and sugar in a medium bowl until blended. Toss in the cabbage, carrots, onion and bacon in the dressing to coat. Season to taste with salt and pepper and then cover and refrigerate the bowl until you are ready to serve. It is a pretty simple recipe that imparts great flavor. I actually used two different cabbages, green and purple, and I used a red onion as well for some different flavor. Salting here certainly draws a lot of the water out of the vegetables so they will not be as crisp and crunchy as you may like. It ends up with a softer, more pickle-like texture instead which was good, but I have to admit I missed some of the crunch. However, the flavor from the buttermilk dressing and the bacon was really good and a nice change for the coleslaw. You could certainly use a bag of coleslaw mix if you did not want to shred the vegetables on your own and I think it would work just as well here. That’s all I have for today. Check back tomorrow for another side dish recipe. This time it will be some easy cornmeal crusted onion rings. Until next time, enjoy the rest of your day and enjoy your meal!